Or: How To Make a Jabberwock Trophy Head. The seed of the idea was planted in my head by this post and its comments. Several weeks and sleepless hours later, the thought takes form – and photographs (click to enlarge). But do I need a stuffed Jabberwocky head in my life? I hear you ask. A beheaded (or rather dis-embodied) Jabberwocky is a symbol of triumph over oppression, whether in your past or your future. You should have one by you at all times. Don’t worry if your sewing skills are not of the finest – that is no impediment to successful Jabberwock creation. They are known to be ugly beasts, and having your head chopped off does nothing for the looks. 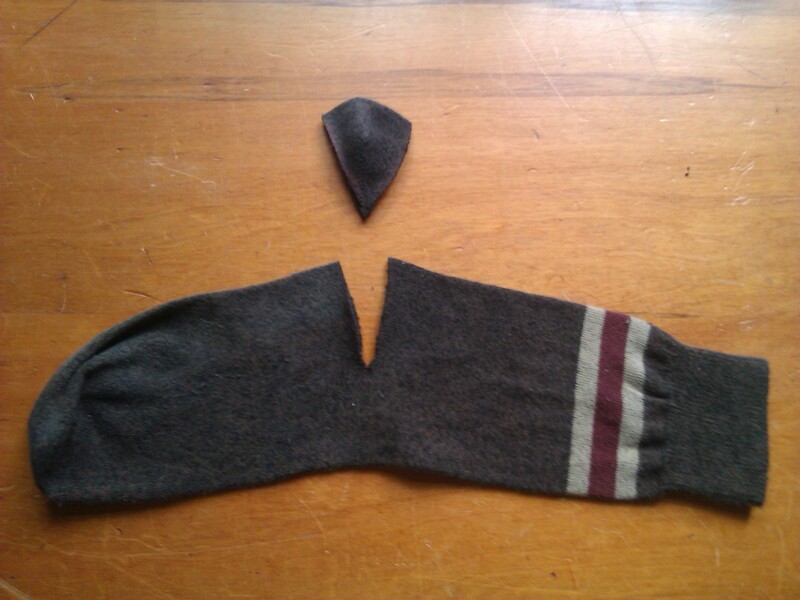 First, cut the heel out of your sock, and put it aside. Your sock should now be tubish, but with a slit in it. 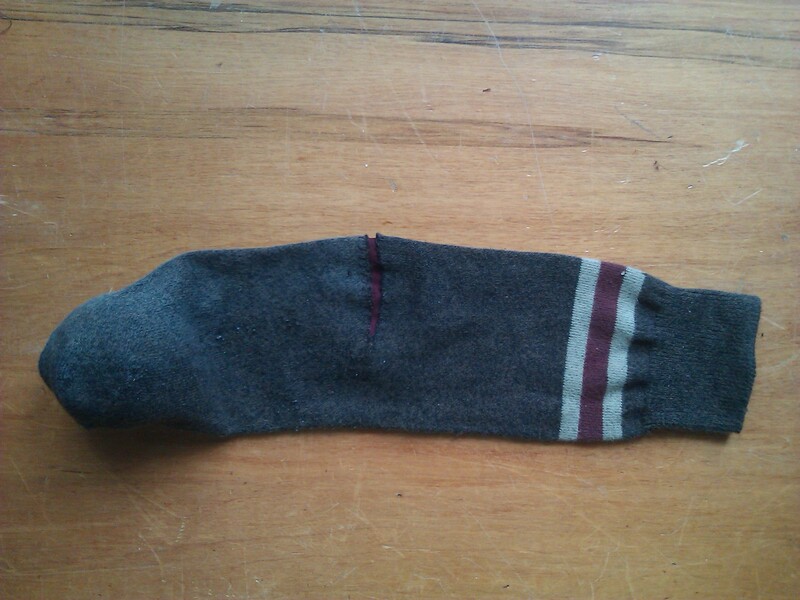 Cut a piece of fabric (I used red) big enough to fill in the slit and apply it to the wrong side of the sock. 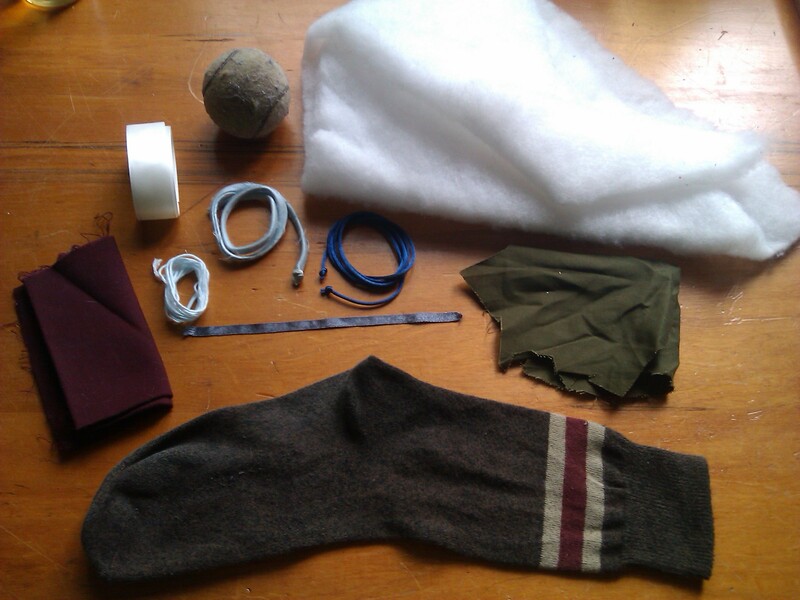 A bit fiddly, but best done when the sock is right-side out, in my opinion. This forms the first hack neck-wound; have it as wide or as narrow as you like. Use blanket-stitch to attach the raw edges of the sock to the under-fabric. Ragged and messy is perfectly acceptable. A vorpal blade is not a delicate weapon. Then insert the tennis ball into the toe of the sock. This will be the head. 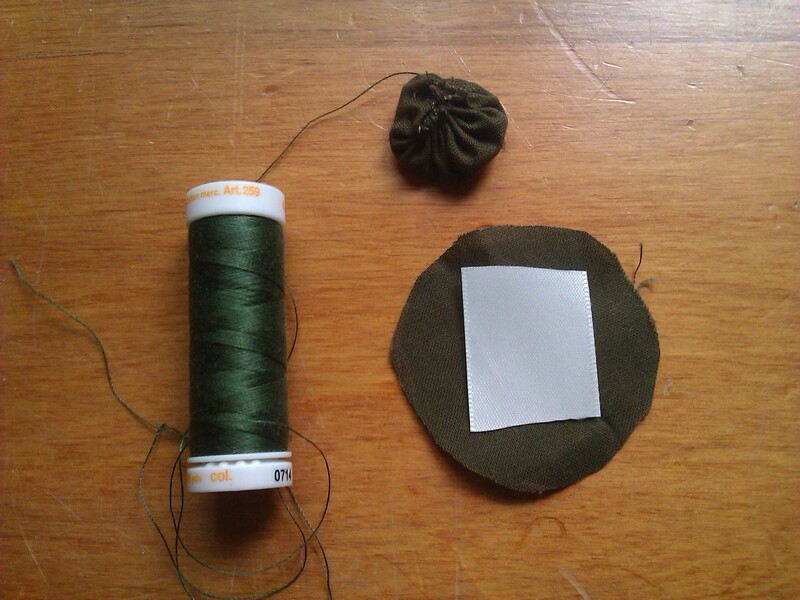 Cut two circles of fabric (I used olive green) each about 5cm (2in) across. Do a quick running stitch round each, about 5mm (1/4in) from the edge. Cut a piece of white fabric or ribbon (about 4cm or 1 1/2 in long) and place this in the centre of the wrong side of each circle, before pulling on the thread to gather the circle into a puff. These are the eyes. Lips: cut the heel piece in half lengthwise, then fold each half lengthwise (right side out) and whip-stitch the raw edges together, folding in the scraggy ends. Teeth: cut two lengths of white fabric or ribbon (beware, ribbon frays), each twice the length you want the teeth. I made the upper teeth longer than the lower. Fold each piece in half – raw ends together – and sew down the sides. Stuff gently, then quilt a groove down the middle of each to create two teeth (this is where I used the orange thread). If you want it to look extra tidy, you could sew wrong sides together and turn before stuffing – I didn’t, and it isn’t too obvious. (I think.) 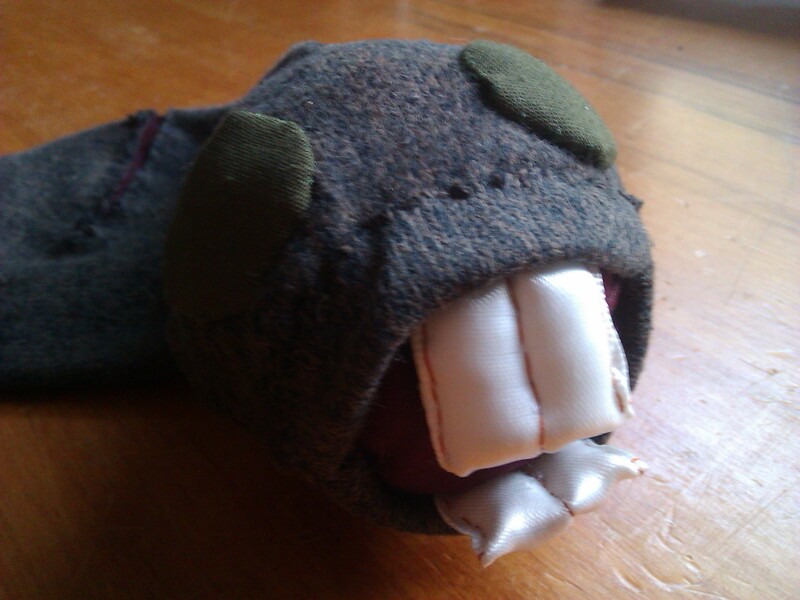 Also sew along the bottom of the teeth so the stuffing doesn’t come out. Cut a piece of fabric (again, I used red) the shape and size you want the mouth. If you aren’t sure, consider the size of the lips. Pin this fabric to the head (refer to pic for placement) and sew down the edges – doesn’t have to be tidy as the lips will cover it. Then sew on the lips by their whipped edges. These should cover the edges of the mouth fabric and teeth. 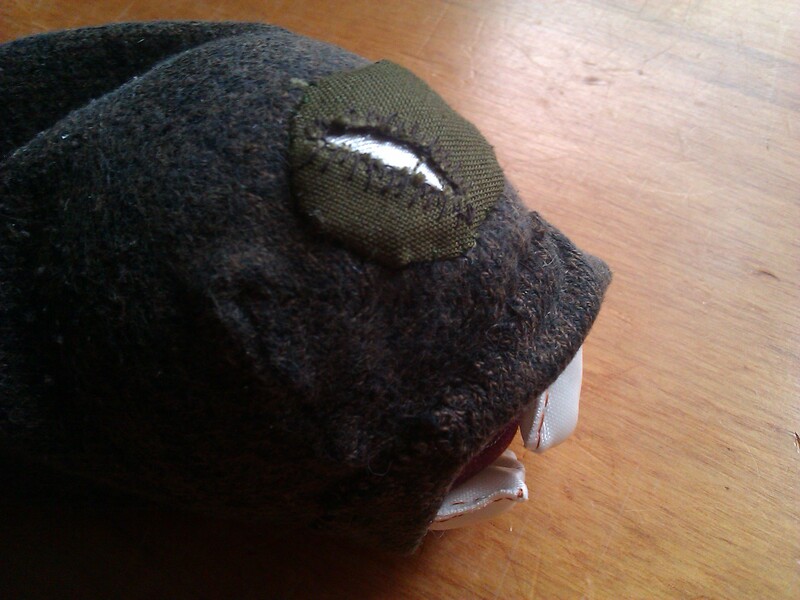 Sew the eyes on smooth side out (refer to the pic for placement) using tiny whip stitches around the edge of each eye. Your Jabberwocky should look something like this. Now the fiddly bit: using a small pair of sharp scissors, cut a slit in each eye about 2/3 of the way down, being careful not to cut right to the edge, or through the white underneath. Neaten the raw edges with whip-stitch or blanket-stitch (eyelashes!). Follow Tenniel’s depiction or your own fancy, whichever you prefer. Trimming: If there are any unwanted bits at the top of your sock – decorative bands, tight ribs etc – now is the time to whack them off. Use a vorpal blade, or failing that, scissors. 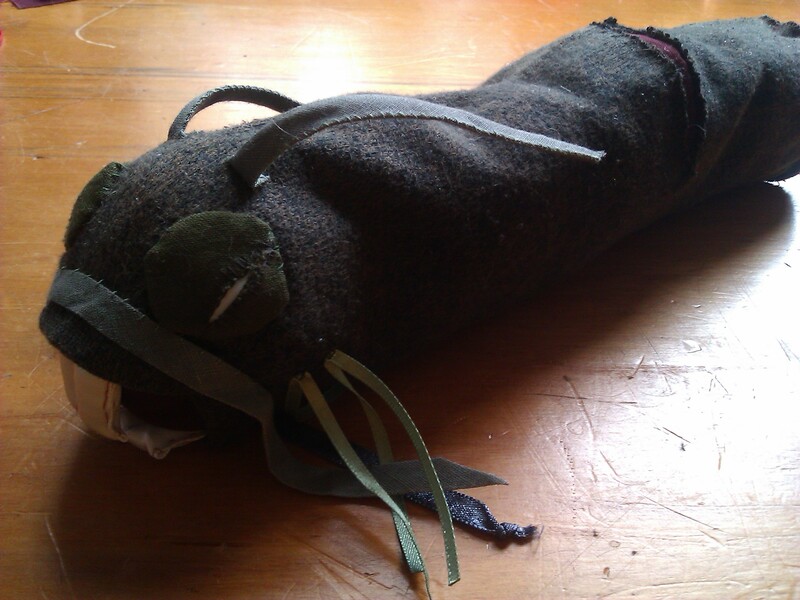 Stuffing: Your Jabberwocky can be stuffed as loosely or as tightly as you like. Too much stuffing, and the head will be smaller than the neck; too little, and it will be a sock with a tennis ball in it. Where the Vorpal Blade went Snicker-Snack: Figure out how wide a circle will be needed to fill the hole at the top of the sock. If uncertain (as I was) try the lids of jars etc until you find one that fits comfortably without stretching the sock. Draw around this on your fabric (I used the red), cut out, and attach with blanket-stitch. Again, this is a gaping wound, so don’t feel your stitches need to be even and regular. O Frabjous Day! Your Jabberwocky is complete. 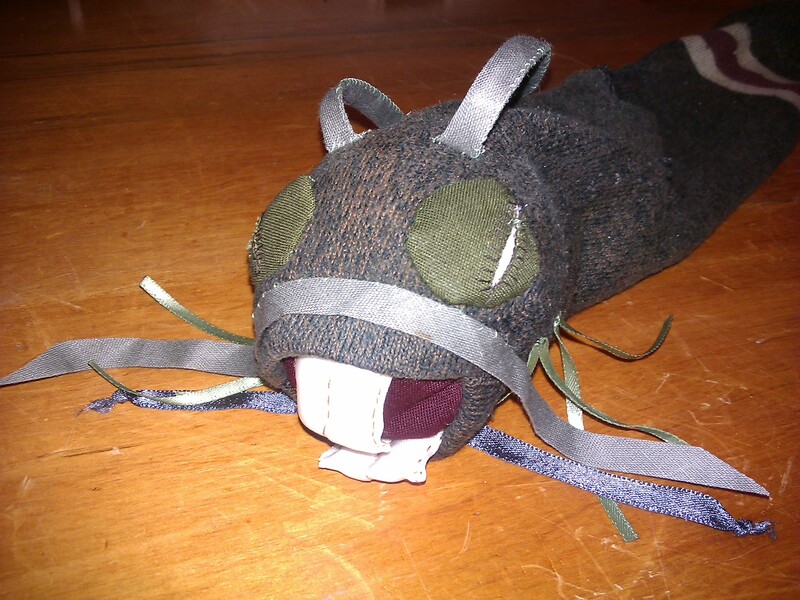 Possible variations include shank buttons covered in fabric for eyes; a loop for hanging the Jabberwocky up; or if you’re feeling very adventurous (and have a long sock), a Jabberwock-Ouroboros or even a Merlion. As with everything I put on this blog, these instructions and photos are licenced under a Creative Commons Attribution Share-Alike 3.0 New Zealand licence. Which means that you are welcome to make any use of it that you please, including your own derivative works (even commercial if you like) as long as you a) say where you got it from, and b) share the same way. Please leave a comment if you make something based on this – I’d love to see what you do with it! This entry was tagged Alice, Creative Commons, Deborah Makarios, handsewing, how to, how to make a jabberwocky, Jabberwocky, Lewis Carroll, merlion, ouroboros, sewing, sock toy, soft toy, stress relief, stress toy, stuffed toy, taxidermy, Tenniel, tennis ball, Through the Looking Glass, trophy, tutorial, ugly. Bookmark the permalink. Apparently the 9th of May is Lost Sock Memorial Day, when one gathers the single solitary socks and mourns for those lost during the course of the year. Speaking of which, I wonder where one can get a darning egg or mushroom these days? Oh. My. This is fantastic! I think everyone needs one of these! You are a clever woman. Thanks! 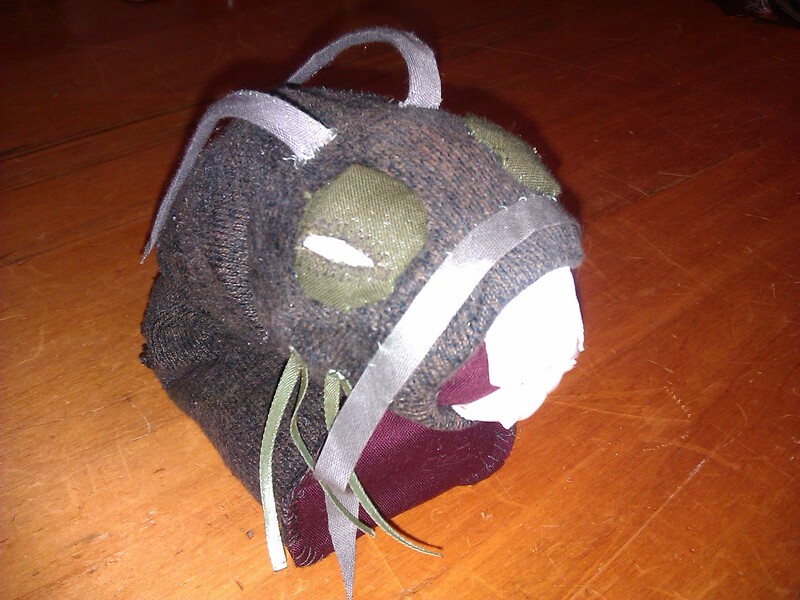 Feel free to reproduce – headless sockmonsters shall populate the earth! Ahem. I shall make one for my 1-1/2 year old nephew, for when he’s no longer in danger of swallowing bits of it. Because, really, what growing child doesn’t need a severed jabberwock head? And what closer tie could aunt and nephew have, than matching severed heads? I’d love to see pics, if you take any.